Classic looks and tone, with modern, hand-built engineering. 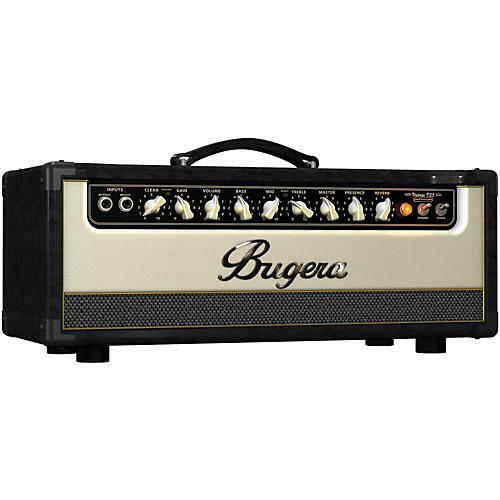 Building on Bugera's original and inspired V55 amp design, the impressively full-featured and hand-built, 55-Watt, 2-Channel Vintage V55 Infinium tube combo amplifier not only exudes vintage sound and style, but possesses modern features that will launch your tone into the sonic stratosphere. Loaded with three 12AX7 preamp and two 6L6 power tubes, this incredible boutique-style powerhouse gives you the flexibility of two independent channels and selectable reverb, both switchable via the included heavy-duty footswitch. Add to this to the revolutionary Infinium Tube Life Multiplier Technology and amazing 12" Turbosound speaker, and the Vintage V55 Infinium becomes one extraordinarily versatile tone-machine that is ideally-suited for the studio, stage, practice room and concert hall! The Vintage V55 Infinium features true Class-A technology with a three 12AX7 front-end and two 6L6 tube power stage. A masterfully crafted all-tube combo amplifier, the V55 provides sweetly-balanced harmonics and natural tube compression, resulting in the warm distortion and break-up youve come to appreciate from those treasured vintage amplifiers of yesteryear. The hand-selected 12AX7 preamp tubes in Vintage V55 Infiniums classic ˜60s-era preamp provide everything from sweetlypurring blues to mind-blowing crunch. The mighty 6L6 power tube is known for its crisp and driving tonal quality when pushed to the max, and the V55 harnesses every last ounce of that power to awesome effect. Years in the making, our Infinium Tube Life Multiplier Technology can extend the usable lifespan of your amplifiers expensive power tubes by up to 20 times, saving you huge money and ensuring the integrity of your tone. How? This revolutionary circuit automatically and continuously monitors the performance of each output tube, and dynamically drives it towards the target operating point, for an evenly distributed load. Infinium also compensates for the effects of aging, automatically adjusting current levels to keep your tubes sounding as good as new “ even when AC line voltages drop below nominal levels. Similar technology has been used for decades in all-wheel drive cars, where systems modulate the power going to each wheel to improve traction. Just consider Infinium Series amps œ4-wheel drive for your guitar. Infinium Series amps take all the guesswork out of tube replacement by illuminating an LED next to a tube that is reaching the end of its usable lifespan. And thanks to Infiniums Auto-Bias design, you simply replace the indicated tube “ without a trip to the repair shop, saving you even more money.